A jolly figure at Puebla's Museo Amparo. 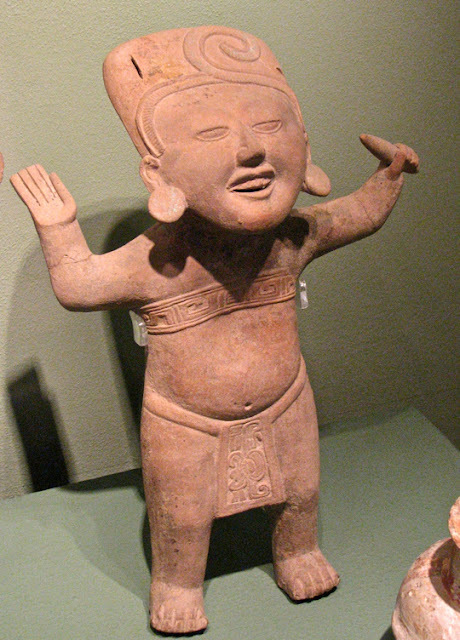 The figure is one of many similar smiling statues found in ancient Mixtec graves in Oaxaca's Monte Alban and Mitla. Apparently, laughing it up and having a good old time was one way to get the gods on your side. In this second posting on the Museo Amparo, I will focus on several themes, including depictions of gods and rulers, men and animals, zoomorphs (combination human and animal figures), the famous Mesoamerican Ball Game, and rituals of death. 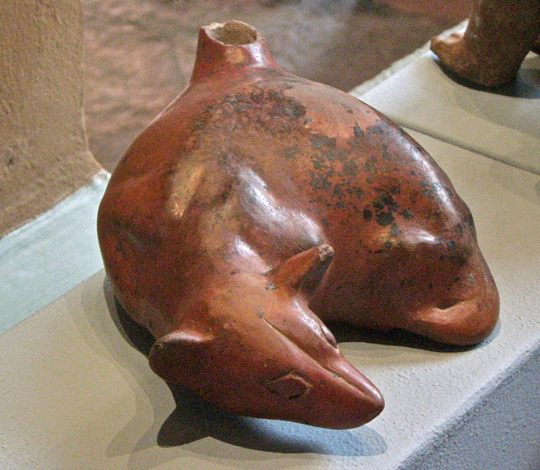 I confess that I had so many photos of wonderful Mesoamerican artifacts that it was at times agonizing to winnow the list down to a usable number for this posting. So, keep in mind that this is only a taste of what is in the Amparo. Gods of Creation, discussing their work. 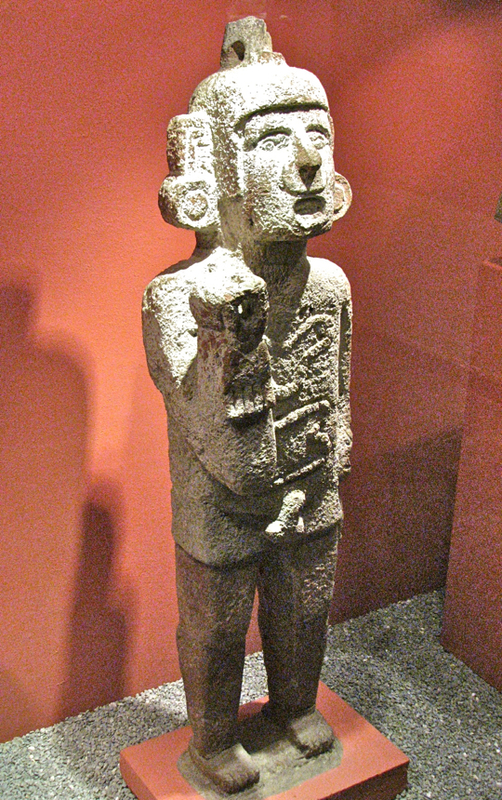 The Maya were the pre-eminent sculptors of Mesoamerica. Their ability to gracefully use sculpture-in-the-round to show people in realistic postures is unsurpassed. 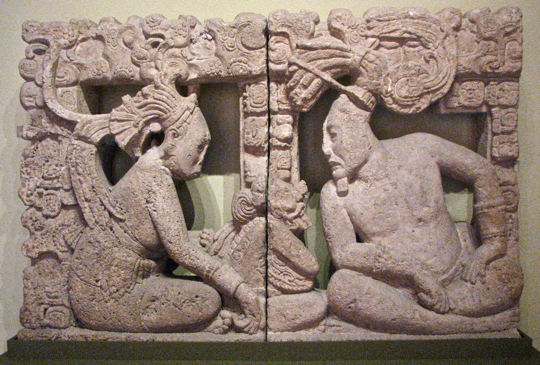 The two figures above are Maya gods of Creation. Here they sit, relaxed in natural postures, obviously very deep in discussion. The god on the right sits cross-legged, leaning toward his interlocutor to make his point. The casual way he supports his left arm on his knee, and the detail of the curled fingers of his right hand are remarkable. The figure on the left also leans forward, but clearly in a listening posture, as he idly fingers the contents of the bowl between them. Surrounding the figures are hieroglyphs that explain the scene. In the anthropological museum of Guatemala City I saw a throne showing two nobles in very similar postures. It may be that the same sculptor carved both pieces. A scowling ruler. 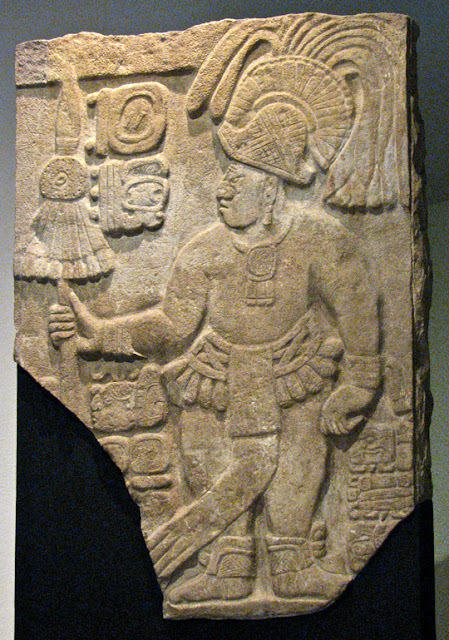 This stela shows ruler standing with his staff of office in his right hand and a deeply scornful expression on his face. The rest of the stela was missing so it was not clear who or what caused the scowl. Probably it was war captives, about to be sacrificed. This was the usual fate of defeated warriors, particularly if they were of royal or noble standing. Captives often appear on such stelae, and sometimes the ruler is shown dancing a jig of glee. 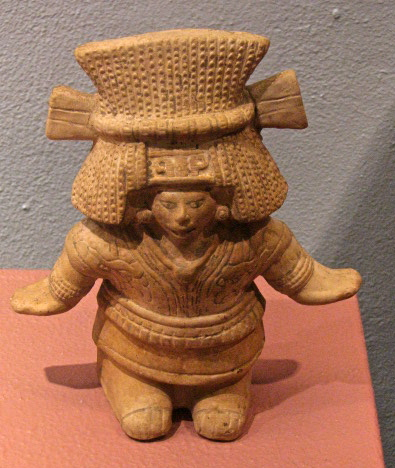 As befits the hot climate of the lowland Maya areas of Yucatan Peninsula, Chiapas, and the northern Petén of Guatemala, the figure is lightly, but elegantly, clothed. He also seems pretty well fed, as one would expect for a person of such status. The drinker. "Sit down and have a beer with me! ", this friendly fellow seems to be saying. His right hand is raised in a casual salute, and a genial smile creases his face, while he holds a cup resting on his left knee. He wears a head dress and large, elaborate rings in his ears and nose. His upper body is tatooed extensively, while his lower torso is covered by a toga-like garment that extends up over his left shoulder. 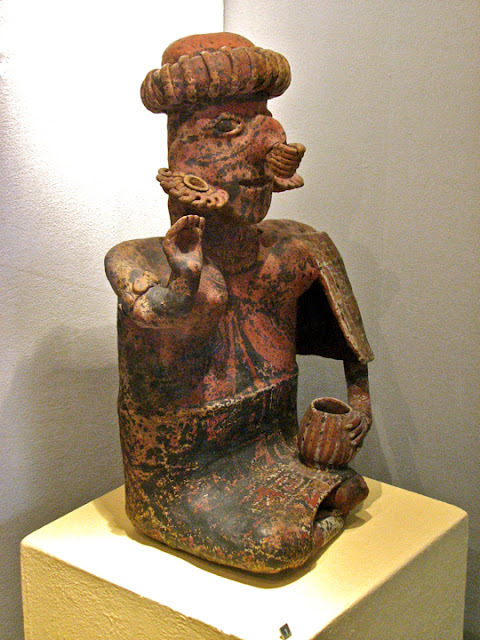 He may be drinking an alcoholic beverage made from a mixture of maiz (corn) and cacao, a form of beer popular at ancient Mesoamerican festivals. The orator. It was not clear to me whether this fellow was addressing a large assembly of people, or perhaps entreating the gods. His gaze may be directed either to those seated on the steps of the temple above him or, alternatively, to the heavens. He is gesturing forcefully and the expression on his face is intense. His features seem vaguely Olmec, with the flattened nose and thick lips one finds on the famous Olmec heads of Mexico's Gulf Coast. The sculptor managed to communicate a tremendous amount of energy through this small piece. The runway model. 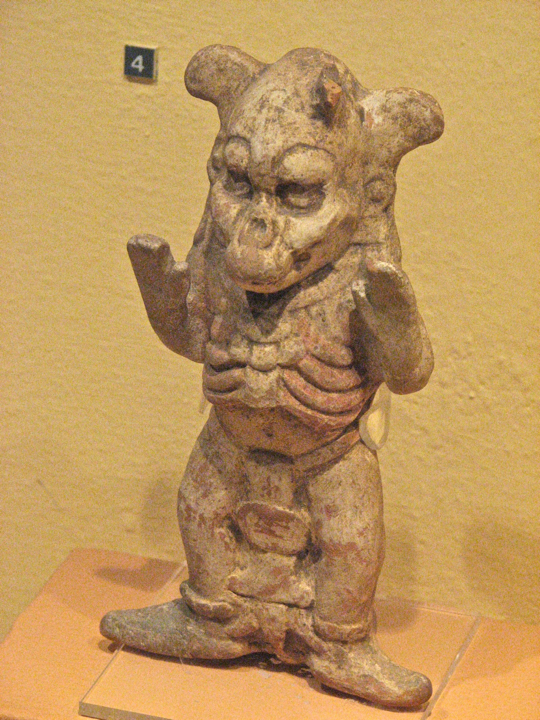 Dressed in fine clothes and wearing an amazing head dress, this figure seems to be saying "look at me!" Arms extended, the figure stands in just the way one would to display a favorite outfit. While I first thought this was a male figure, the posture of presentation makes me think it might be female. However, I am left uncertain because it has none of the usual physical characteristics present in a pre-hispanic female figure. The soldier. At first, I thought this was another orator because of the raised arm, the upturned face, and the mouth open to speak. Then I noticed the erect, almost rigid posture and the small hole formed by the clenched, upraised hand. The hole is horizontal, apparently intended to hold a spear or other weapon extended horizontally through it. The figure wears what appears to be a helmet and armor on his upper body. His shout may be a war cry, or possibly orders to his assembled troops. The shivering man. The sculptor of this piece did a remarkable job of conveying the exact feeling of his subject. The figure sits crosslegged, huddled, with his arms crossed over his chest and gripping his upper body. This is exactly the posture one would take if experiencing a sudden chill. I could almost see the Mesoamerican equivalent of goosebumps all over his body. He definitely looks uncomfortable. Somebody give this guy a blanket! Man munching a snack. This was one of my favorites. 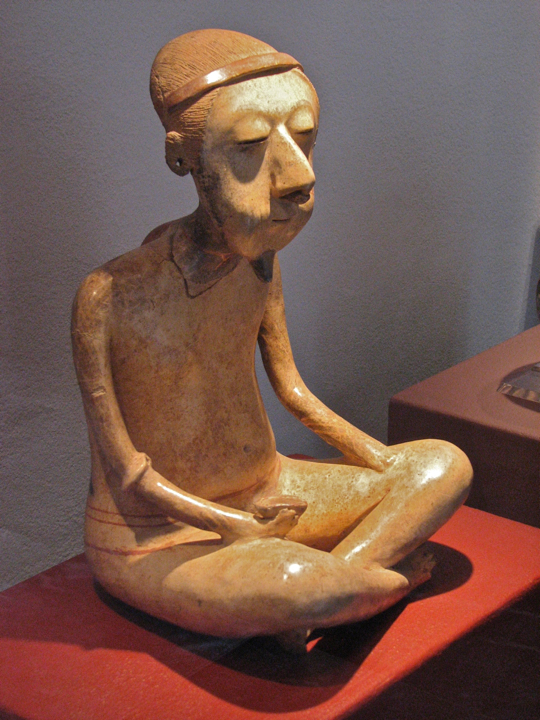 Once again sitting crosslegged, a common Mesoamerican posture, this man's cheeks bulge as he chews some of the snack he holds in his right hand. His eyes are half closed, as if he is supremely enjoying the taste. Notice the elongated head. Upper class families often shaped the heads of their babies so that they would take such an elongated form as adults. This was one way of distinguishing themselves from the common people. Snarling cat seems ready to pounce. The cat was found in a tomb in the Colima area. 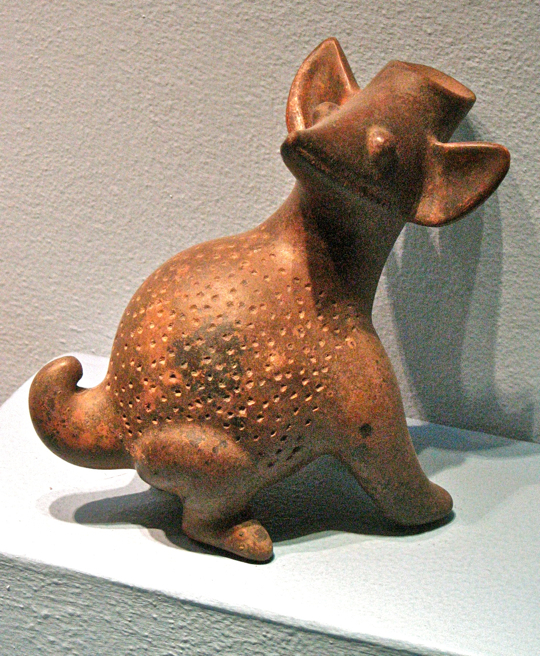 It is very similar in posture, style, and finish to the famous Colima dogs so often found in such tombs. 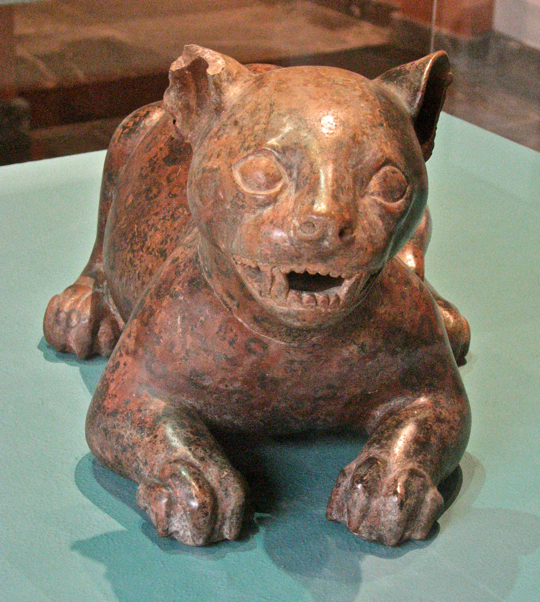 Cats, particularly jaguars and pumas, were extraordinarily powerful symbolic figures throughout the various Mesoamerican cultures. They represented power and skill, and their association with the night connected them to the underworld of death. 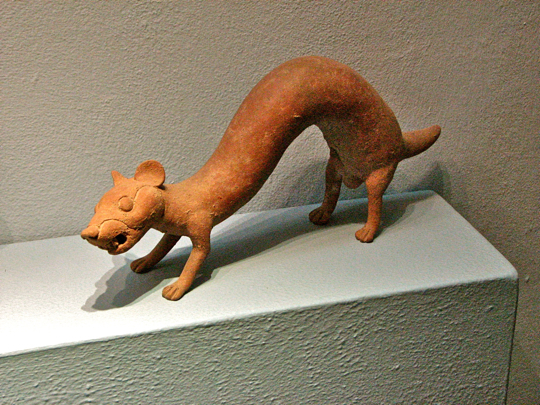 A Colima Dog. 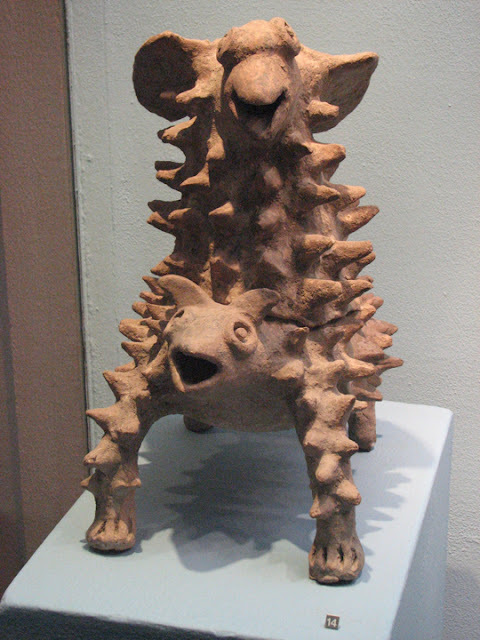 I have always enjoyed the natural and realistic postures in which Colima dogs are portrayed by ancient sculptors. Until I moved to Mexico, I was a dog owner for many years. I still enjoy other people's dogs, and those I befriend while walking the streets of the village where I live. This ancient dog lies in exactly the posture I have seen live dogs assume, with legs and tail curled under him. He has obviously just heard something and has perked up his ears and slightly raised his head. Perhaps his master is approaching, or he has detected the telltale noises of food preparation in the kitchen. Curious George. This little creature, perhaps some kind of forest rodent, has stopped in his tracks. He is frozen by curiosity, with his head turned to whatever attracted his attention. The artist has cleverly used small indentations to suggest the spots on his coat. A fat monkey, ready to burst. 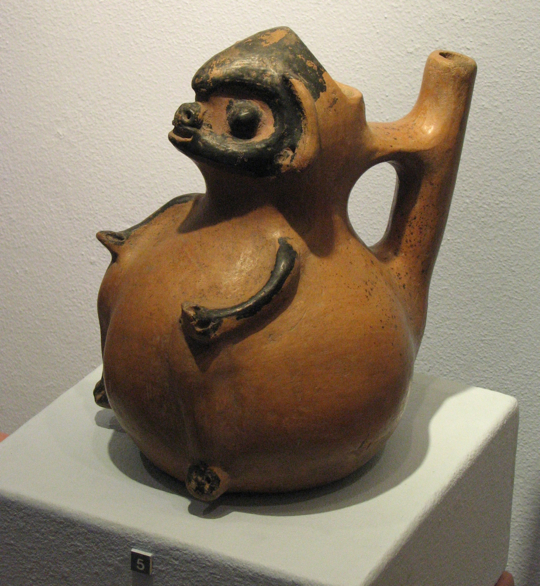 The sculptor has transformed this pitcher into a lively, rotund image that may be a monkey. Pitchers, bowls, and pots and other household implements were often decorated with animal or human themes. Why settle for a boring old pitcher, when you can have something like this on your shelf? Angry weasel arches his back. His teeth bared and back arched, this weasel expresses its anger and willingness to attack if further molested. Again, this talented sculptor has captured emotion, energy and the possibility of fierce action. 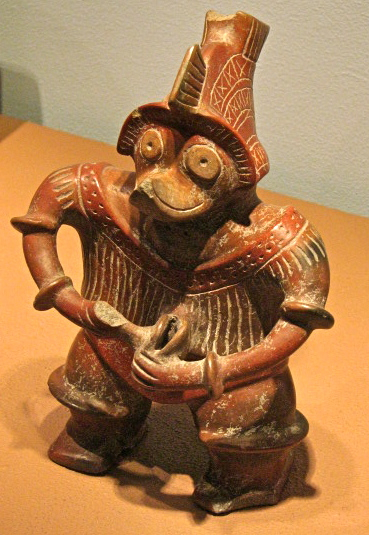 Pre-hispanic ancestor of Donald Duck? This cheerful-looking little duck-billed guy is a zoomorph, a figure with both human and animal characteristics. Some zoomorphs are mixtures of different animals. For example, Quetzalcoatl, the famous Plumed Serpent, is a mixture of a snake and the quetzal bird. While zoomorphs generally have serious religious connotations, I can't help feeling that this sculptor had a sense of humor about his work. Note to the Disney Corporation: check your copyright, this guy definitely got in ahead of you. Waahoo! Ride 'em cowboy! Above, a thorn-studded reptilian creature is ridden by another with a similar hide, but big ears and a bird-like beak. This was one of the wildest and funniest of the zoomorphs I encountered in the Amparo. What imaginations these people had! 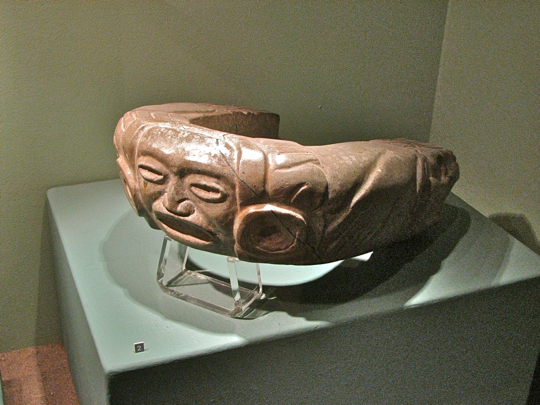 Richly decorated human head with an animal snout. This was obviously a figure of some importance, given the elaborate head dress, ear rings, and cloth on what remains of the left shoulder. The torso from the shoulder down seems to have been lost or destroyed. The opening at the top may indicate use as an incense burner or a container of some kind. Frog with a papoose. 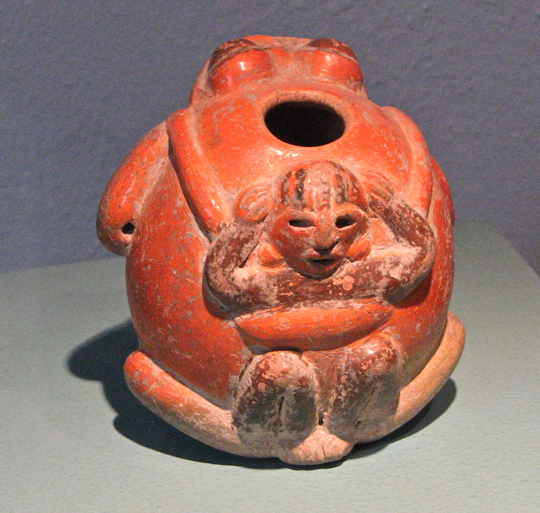 This rather fat frog came with a small figure strapped to its back, as a mother would carry a baby or small child. The smaller figure appears to have some human characteristics, but also has large floppy ears and is definitely not a baby frog. The hole in the top indicates this piece may have had some household use. The thinker. Above is a beautifully proportioned figure of a seated man with the head of a rabbit. The figure seems deep in thought. To the Mayans, the rabbit symbolized cleverness, games and competition, and an active mind which must always be occupied. 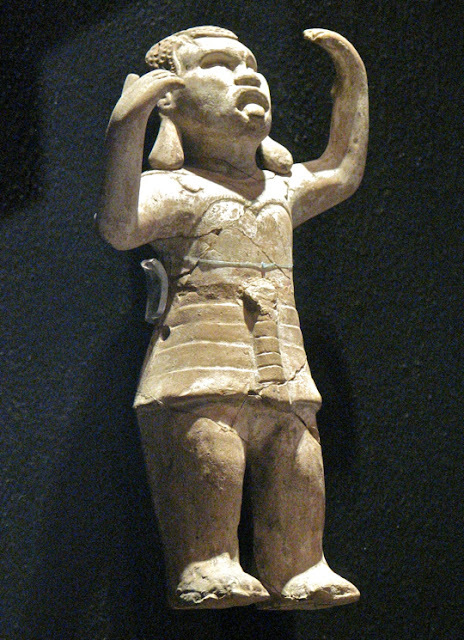 To the Aztecs, tochtli (the rabbit) was associated with the direction South and the deity Xiuhtecuhtli, who is in turn associated with youth, vigor, rulership and warriors. 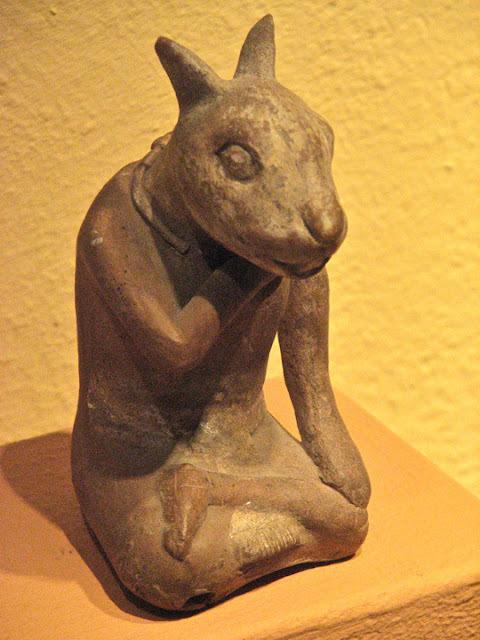 To the Zapotecs of Oaxaca's Monte Alban, the rabbit was associated with the moon, because the silhouette of a leaping rabbit resembles a crescent moon. Monkey-man reaches for the sky. This figure has the face of a monkey, but the body of a human. He stands with his hands up, palms forward. Since there was no explanation with the piece, it is difficult to say what this posture might mean. However, it is the stance one might take to quiet a crowd, or to supplicate someone angry. In addition to a loincloth, the figure is wearing either a very interesting jacket, or some sort of armor. The Aztec monkey (Ozomatli) was associated with the direction West and the deity Xochipilli, god of music, dance, arts, games, and fun. Perhaps the fellow above is a comedian, quieting the crowd for his next joke. 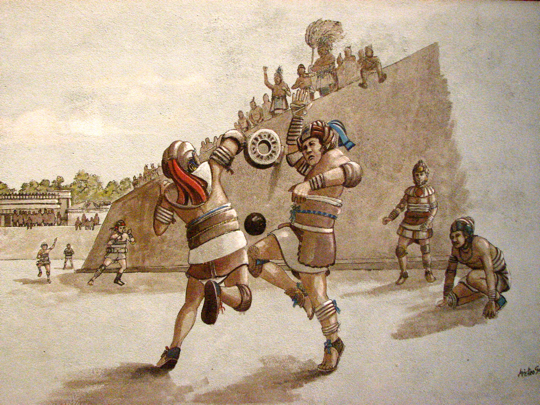 Players face off in the famous Mesoamerican ball game. 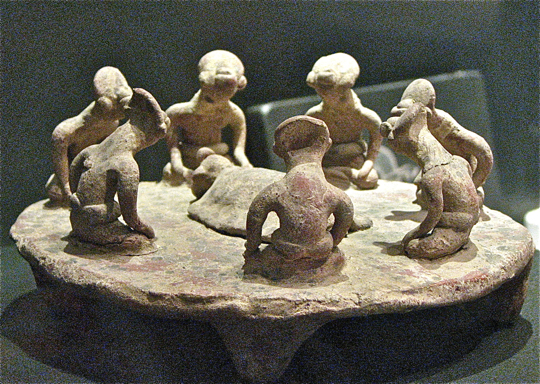 The origin of the Mesoamerican ball game reaches far back into the area's earliest civilizations. Ball courts have been found everywhere from Honduras in Central America, to the Wupatki ruins in northern Arizona. 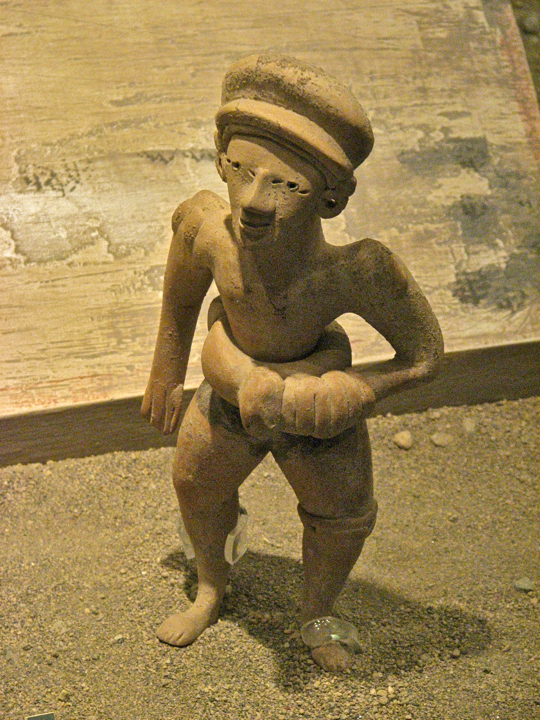 Hard rubber balls, similar to the one shown above, have been found in very early Olmec sites, dating back to 1500 BC. In the scene above, two players fight for possession of the ball. Neither is allowed to touch it with hands or feet. The exact rules of the game are unknown, but in some variations, scoring involved propelling the ball through the ring you can see on the wall in the background. At Chichen Itza, the ring is attached to the wall 6 meters (20 ft) above the ground! Not all courts contained such rings, however. Game time! The ball player seen above is dressed with a helmet, a waist protector called a yolk, and additional protectors for his left knee and left hand. Such protection was necessary, particularly for the abdomen, because the heavy ball could be propelled with enough force to seriously injure or even kill a player. If that were not enough to give a prospective player pause, team members were sometimes sacrificed after the game. Relief sculptures at Chichen Itza clearly show such beheadings. Nearby the Chichen Itza court is a tzompantli (large stone platform) , sculpted along the sides with hundreds of human skulls. The heads of decapitated players were displayed there. 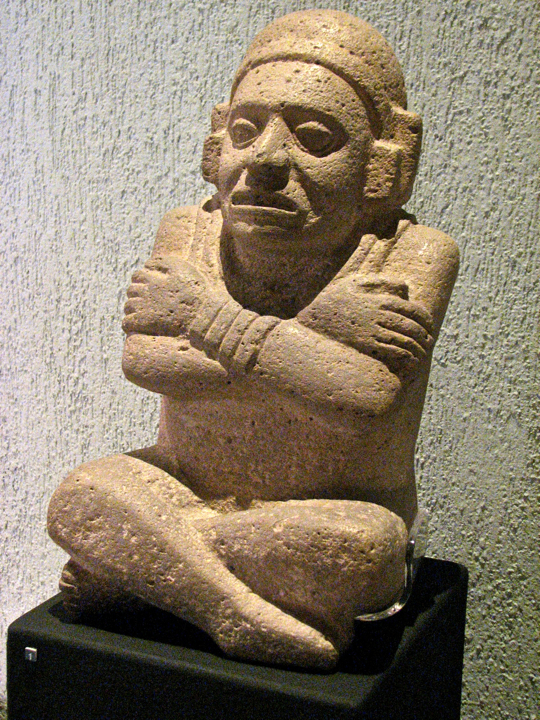 In Tollan, capital of the Toltec Empire north of Mexico City, a tzompantli is also found adjacent to their court. Archaeologists disagree whether it was the losers who were beheaded as a sign of disgrace, or possibly the winners as a way to honor the gods. The actual ball courts themselves were considered living beings, brought to life at their inauguration by the sacrifice of a captive. Ball player's ceremonial yolk. This heavy stone yolk, decorated with a human face, was clearly for ceremonial purposes because it would have been much too heavy to wear in a game. Actual game yolks were probably a mixture of animal hide and cloth. A version of the ball game, called ullama, is still played by indigenous tribes in Sinaloa State in northwestern Mexico. Ancient funeral ceremony. This little piece was touching in its portrayal of reverent grief. On a circular platform about the size of a small pizza, 7 figures are grouped around a body draped with cloth. They sit quietly, but attentively, heads bowed and hands on knees. Death is a mysterious and important process in all cultures, and particularly to ancient people. While the bodies of kings were sometimes buried in great pyramids like that of Pakal the Great at Palenque, lesser people were often buried in or under their houses. The goods buried with the dead have formed one of the best sources of information about these ancient cultures. The burial offerings show what the ancient people considered valuable and important in life. Such offerings often include jewelry, weapons and tools, clothing food, religious images and many other objects. 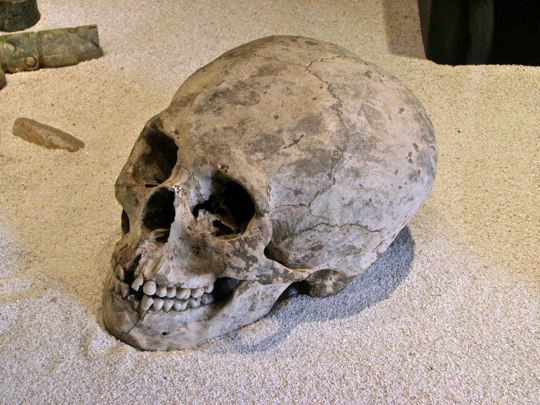 Elongated skull recovered from an excavated tomb. 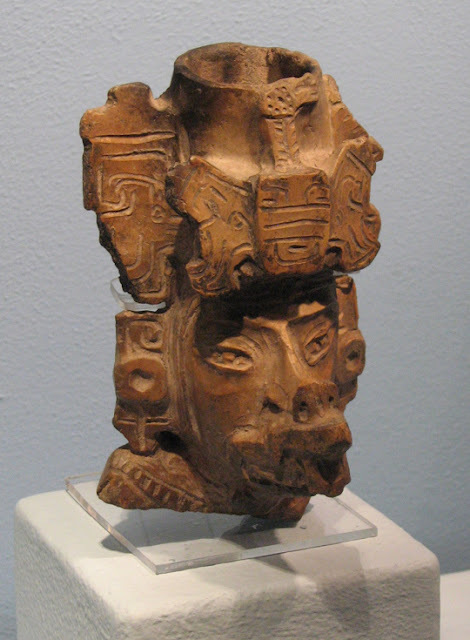 Mesoamericans, particularly the Maya, used a practice called cranial deformation as a method of social differentiation. This involved binding the skulls of the infants of those in high social classes so that they grew into an elongated shape. That shape marked them as members of the noble class. Cranial deformation has been practiced all over the world, as far back as neolithic times. Among others, it was used by the Choctaw Indians of the Southeast US, the Aborigines of Australia, and the Huns of the steppes of Eastern Europe. While the "civilized" people of today might think such practices barbaric, our cultures practice plastic surgery and liposuction to alter our bodies for purposes of beautification. We are not, in the end, so different from these ancient people. This concludes Part 5 of my series on Puebla. I hope you have enjoyed the Museum Amparo. If you have any feedback or comments, please leave them either in the Comments section below, or by emailing me directly. If you leave a question in the Comments section, PLEASE leave your email address so that I can respond. Love the man munching a snack. It almost looks like he's wearing a button down collar. A lot of very human attitudes were preserved in the Amparo.